An altogether-too-short year of my life was spent living and working in Japan. Every country has its unique charms, but Japan has more than its fair share. I lived in a small city called Ichinoseki, Iwate in northen Japan and even there in that sleepy town, on every trip out of the house I encountered something surprising. A tiny shrine devoted to the spirit of a stone, a garishly decorated van with a giant whale tail, a chorus of a thousand frogs singing in a nearby rice field at night, a hyper, futuristic video arcade featuring games devoted to smashing cockroaches, square watermelons that cost more than any fruit should. 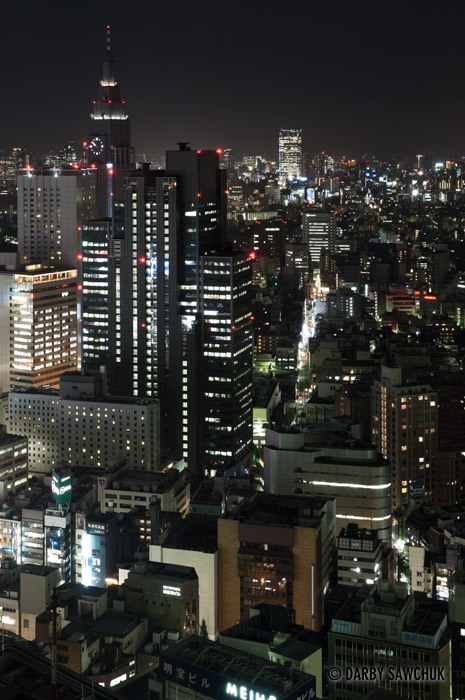 I could go on for ages – I have so many memories that would seem out of place if they had happened anywhere but Japan. Though the bulk of my time was spent in Ichinoseki, I had the privilege to travel in a large portion of the country, so this collection of images of Japan isn’t isolated to the Tohoku region in the north. Here you’ll find a bit of everything from seasonal landscapes in the countryside to centuries-old temples in Kyoto to the ultra modern architecture in Tokyo. 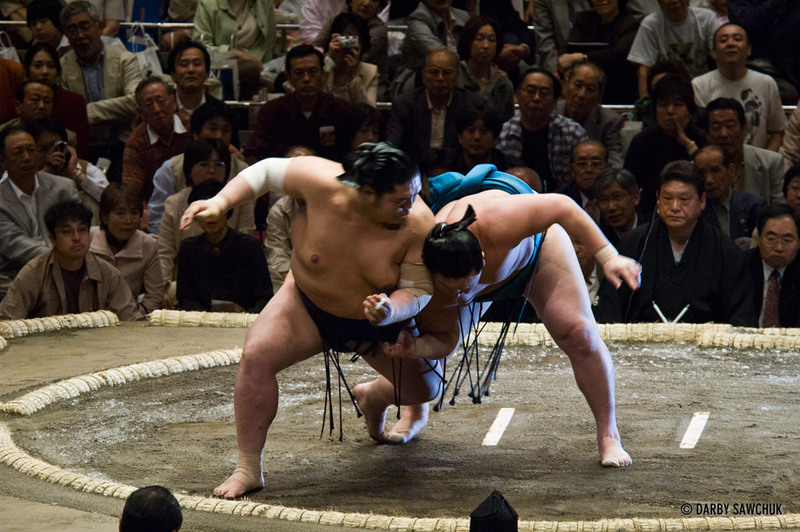 If you want to see more of Japan and one of its more impressive traditions, check out my photos of sumo wrestling here. 01. 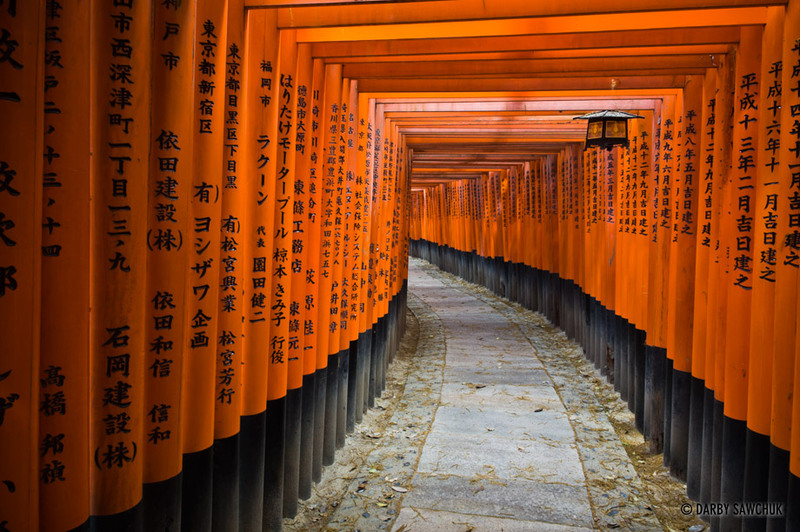 Thousands of red torii gates line the paths at Fushimi Inari Shrine in Kyoto, Japan. 02. 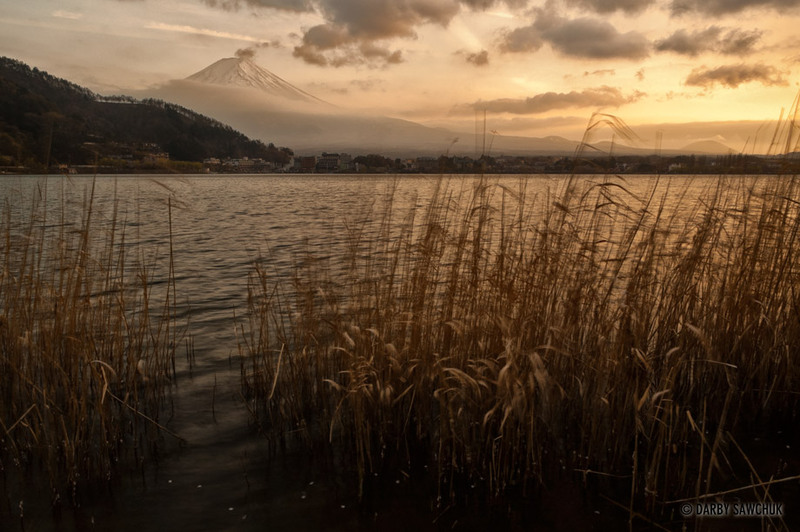 Mount Fuji rises behind on of the Fuji Five Lakes at sunset in Japan. 03. 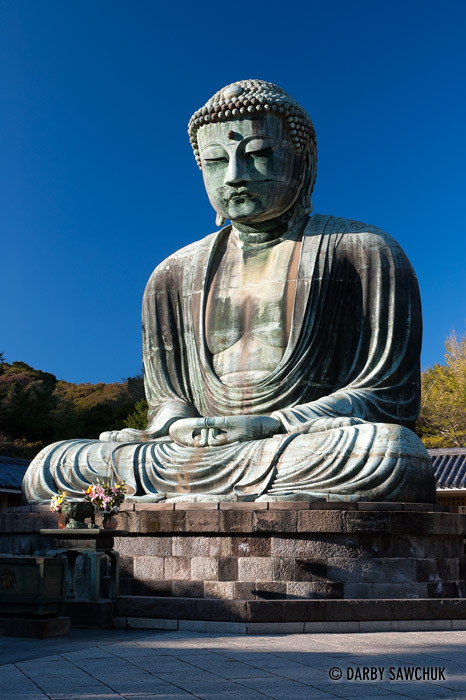 The Great Buddha of Kamakura, a bronze statue of Amida Buddha stands at Kotokuin Temple in Kamakura, Japan. 04. 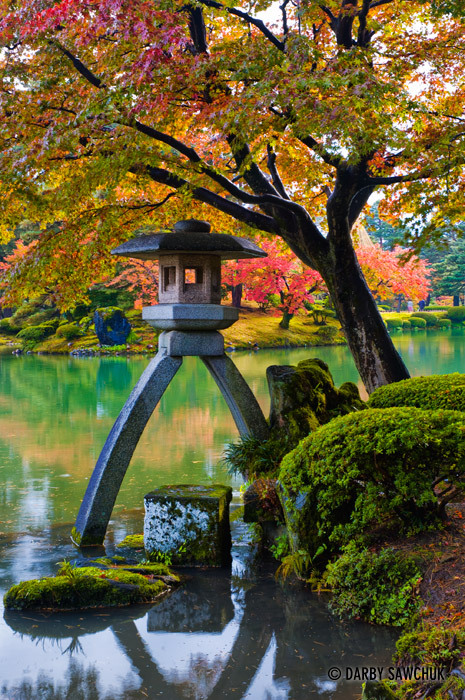 The iconic Kotoji-toro lantern in Kenrokuen garden in Kanazawa, Japan. 05. 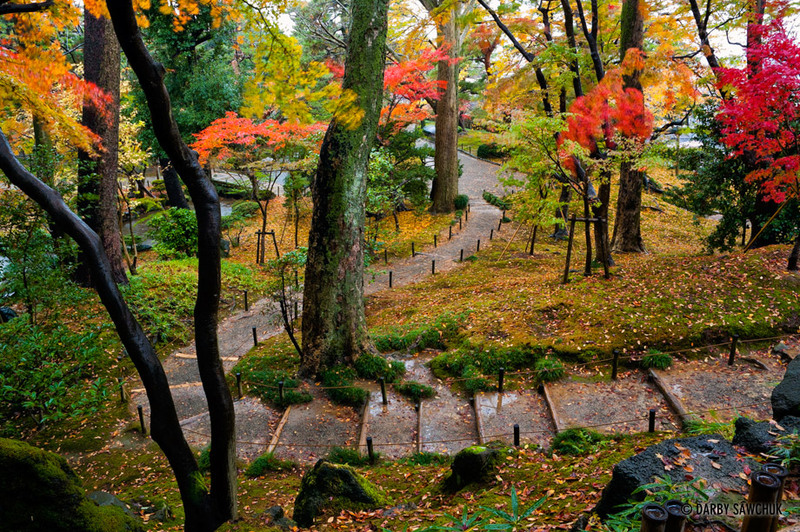 Fall colours over a winding path in Kenrokuen garden in Kanazawa, Japan. 06. 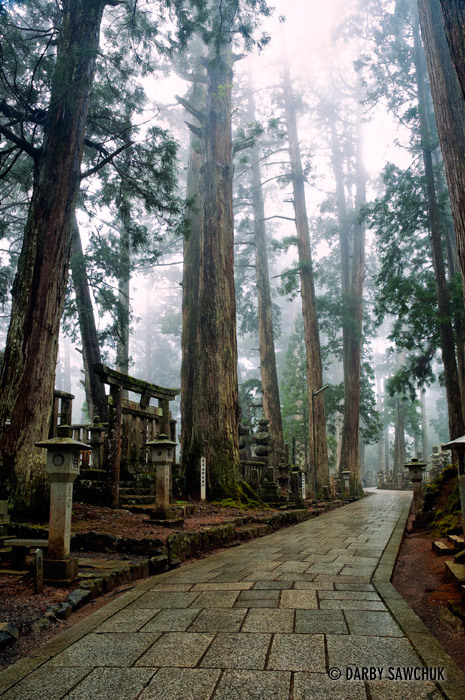 A path through the forest cemetery at Okunoin temple on Koyasan, Japan. 07. 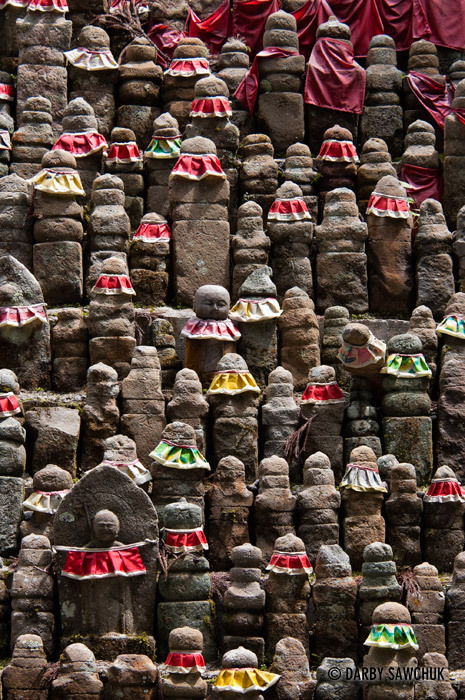 A group of stone Jizo statues at Okunoin temple on Koyasan, Japan. 08. 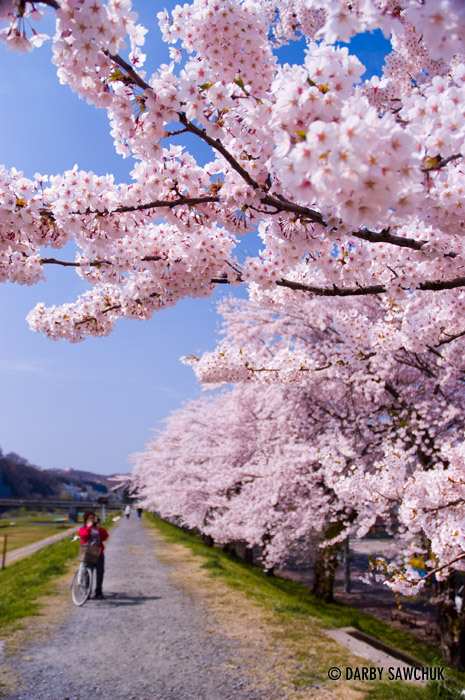 Cherry blossoms in spring in Ichinoseki, Iwate, Japan. 09. 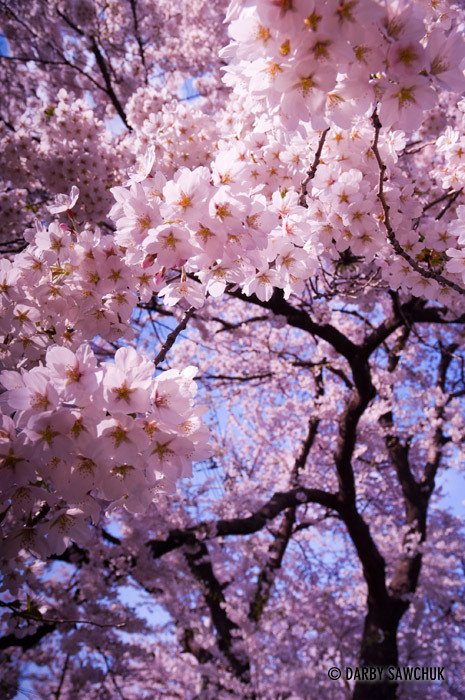 A cherry blossom tree in spring in Ichinoseki, Iwate, Japan. 10. 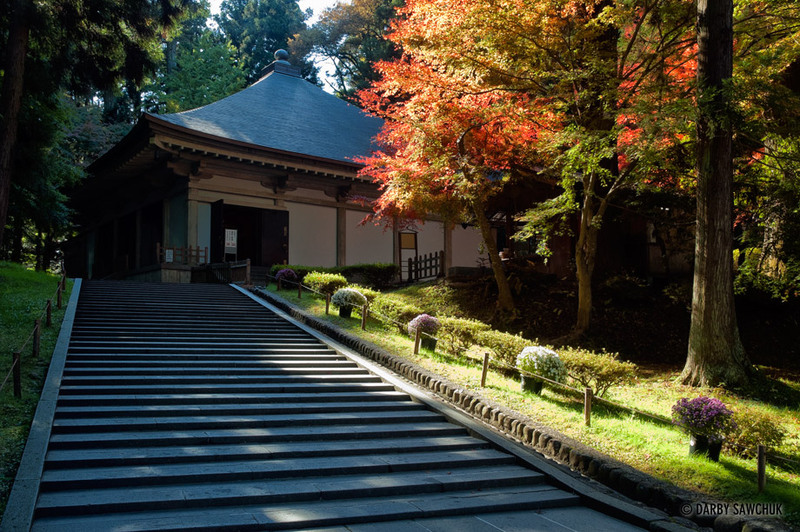 The building housing Konjikido Hall in the Chusonji temple complex in Hiraizumi, Japan. 12. 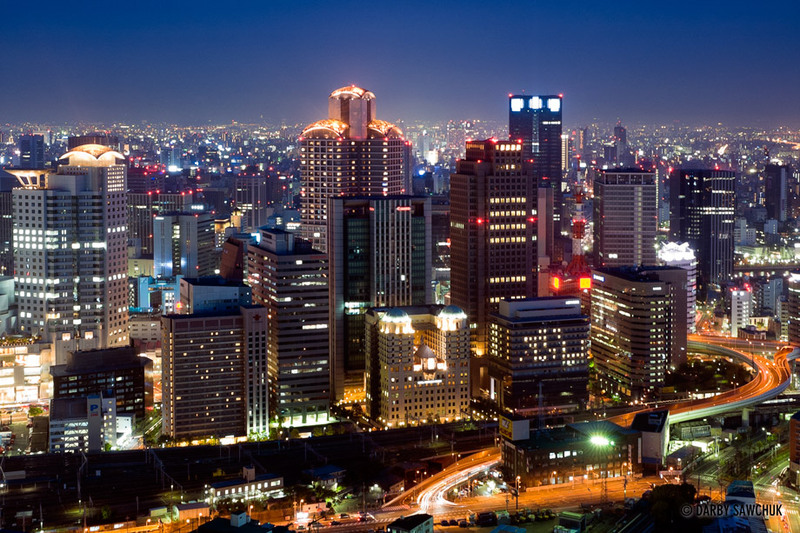 A nighttime view of the skyscrapers of the Osaka skyline. 13. 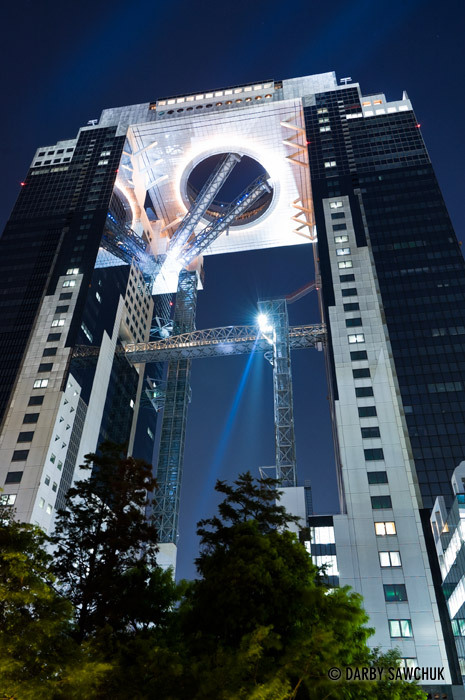 The futuristic Umeda Sky Building in Osaka, Japan at night. 14. 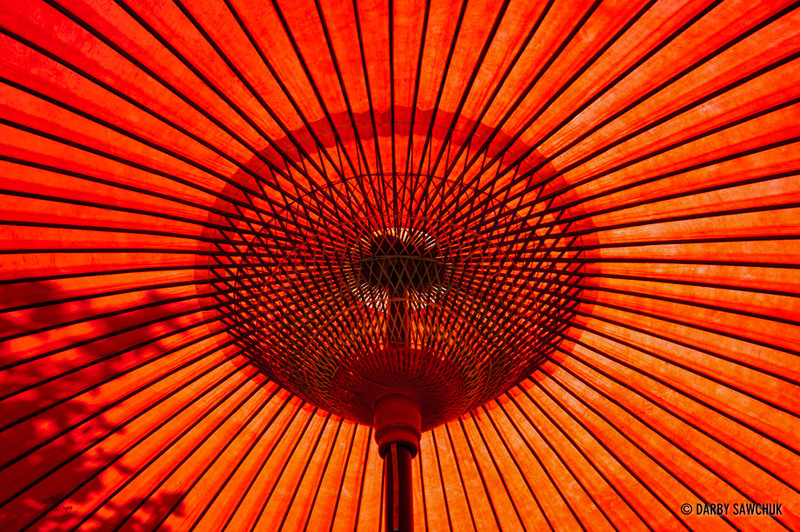 A traditional red Japanese parasol. 15. 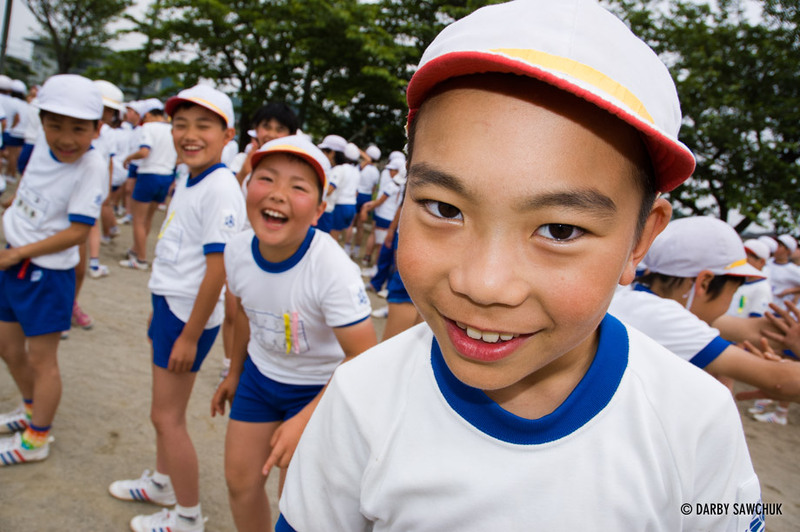 Students mug for the camera on a sports day in Ichinoseki, Japan. 16. 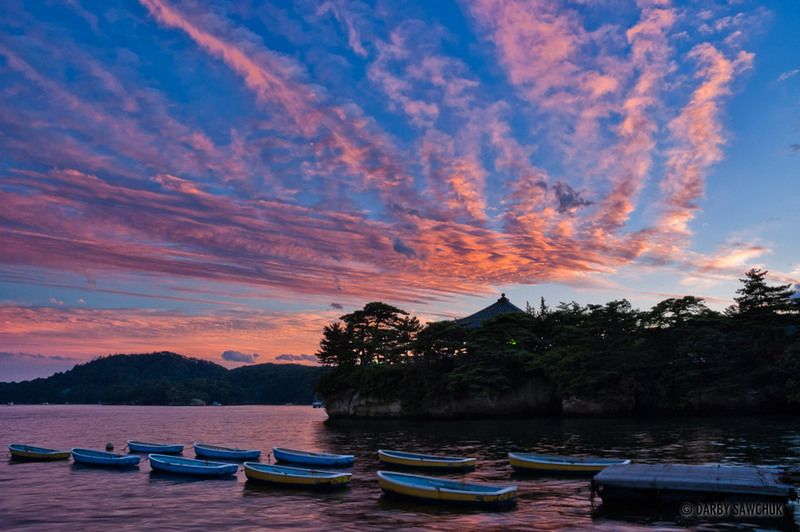 Rowboats float in Matsushima Bay with Godaido Hall in the background at sunset. 17. 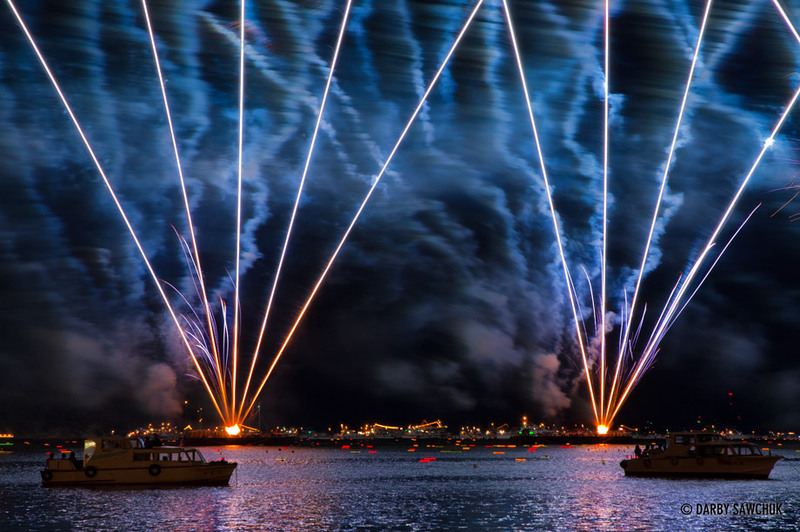 Fireworks burst from the ocean behind boats in the harbor during the Matsushima lantern festival in Miyagi prefecture Japan. 18. 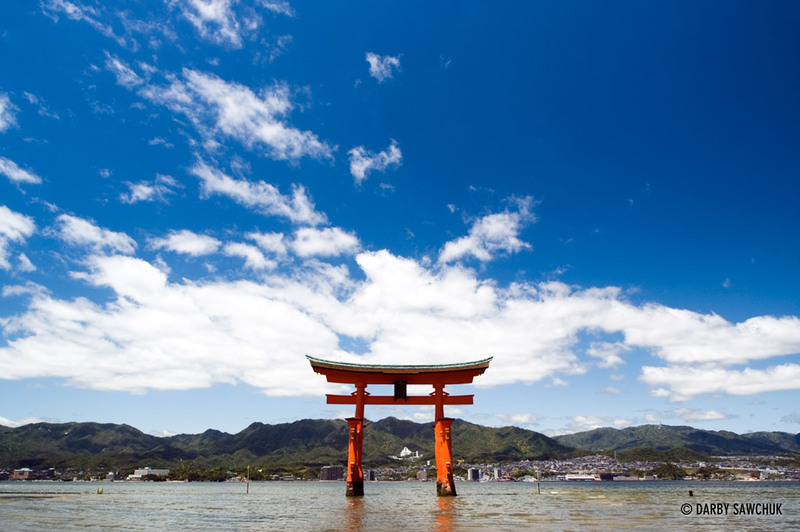 The floating torii gate of Miyajima stands in the bay near the Itsukushima Shrine. 19. 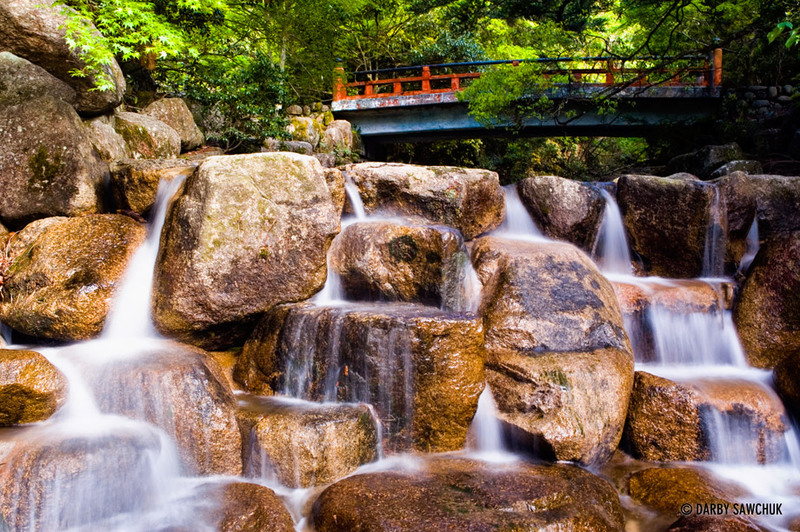 A bridge stretches over a waterfall near the base of Mount Misen on Miyajima, Japan. 20. 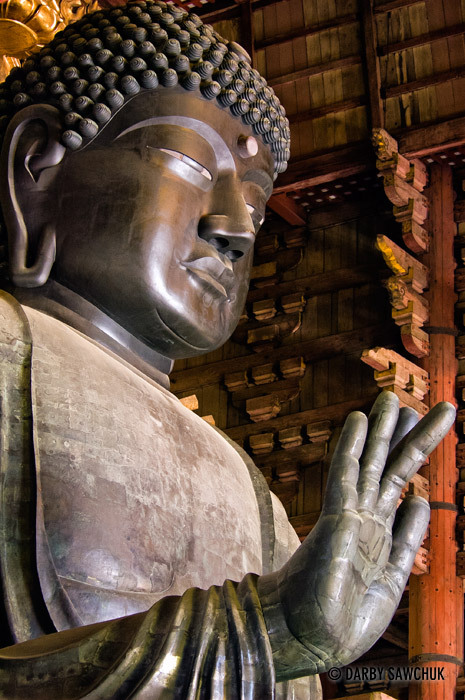 Japan’s largest Buddha statue sits peacefully inside Todaiji temple in Nara, Japan. 21. 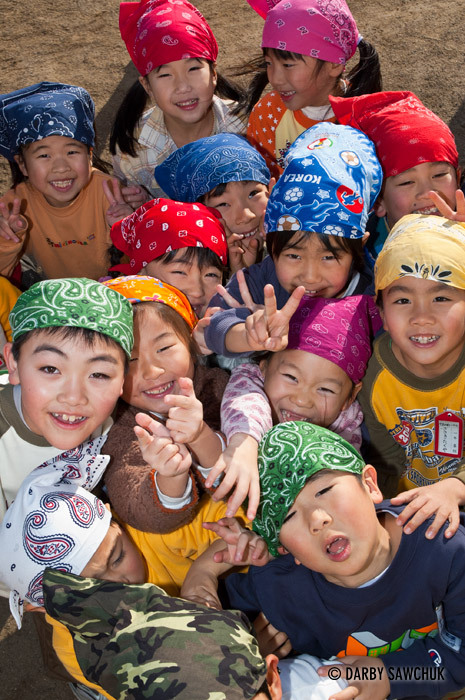 Japanese kids playfully crowd together for a photo. 22. 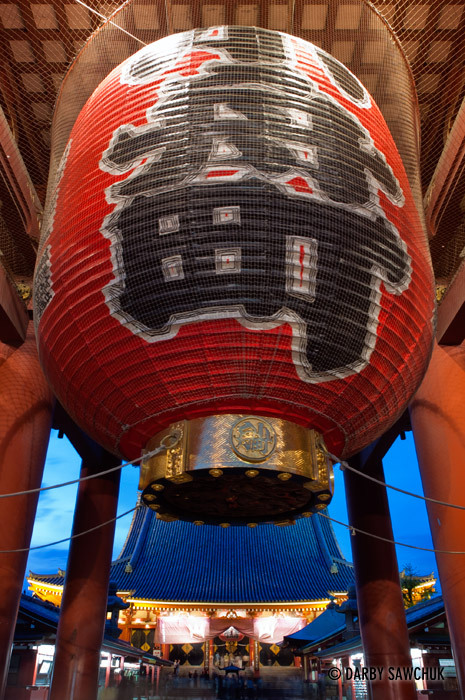 The giant lantern hanging in the Hozomon gate at Sensoji temple at night in Asakusa, Tokyo, Japan. 23. Japanese schoolchildren give the peace sign at Sensoji temple in Asakusa, Tokyo, Japan. 24. 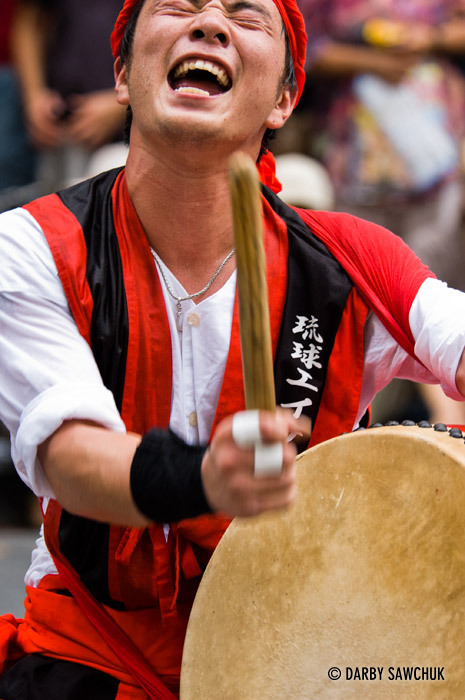 A drummer performs at a drumming and dancing summer festival in Shinjuku, Tokyo, Japan. 25. 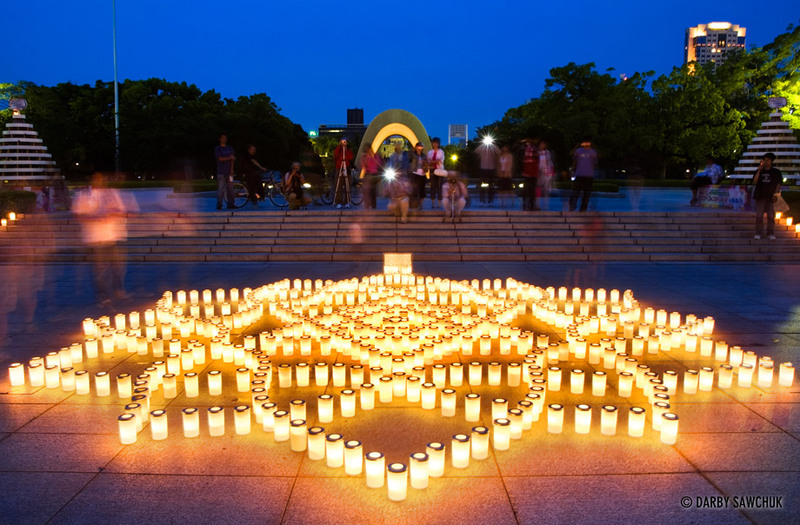 Hundreds of candles are lit in the Peace Memorial Park in Hiroshima, Japan as part of a Flower Festival. 26. 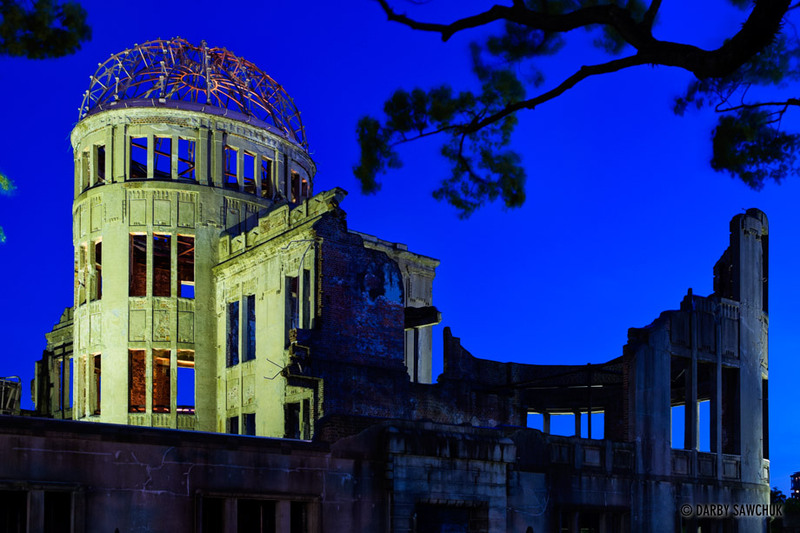 The A-Bomb Dome, a ruined structure memorializing the atomic blast of August 6, 1945 in Hiroshima, Japan. 27. 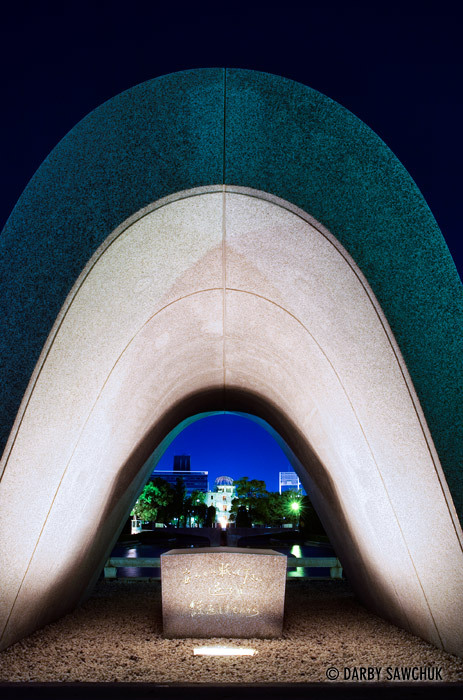 The cenotaph memorial in the Peace Memorial Park in Hiroshima, Japan. 28. 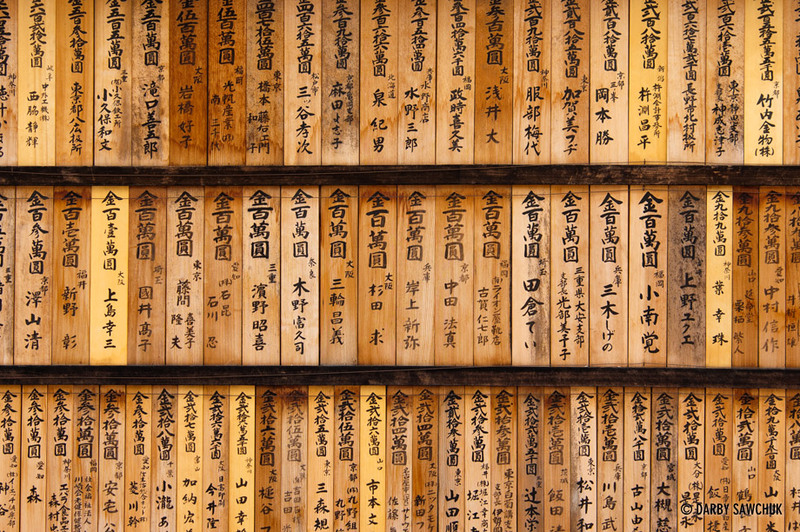 Prayer boards displayed at Fushimi Inari Shrine in Kyoto, Japan. 29. 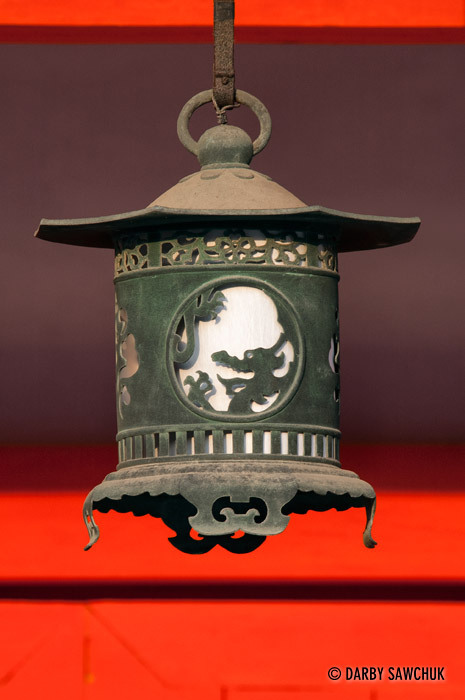 A hanging lantern at the Heian Shrine in Kyoto, Japan. 30. 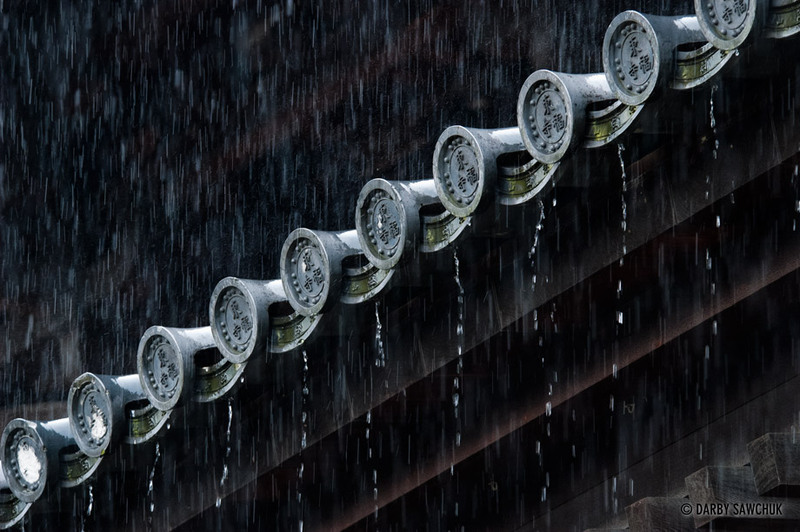 Rain drips from the roof of the Tofukoji Temple in Kyoto, Japan. 31. 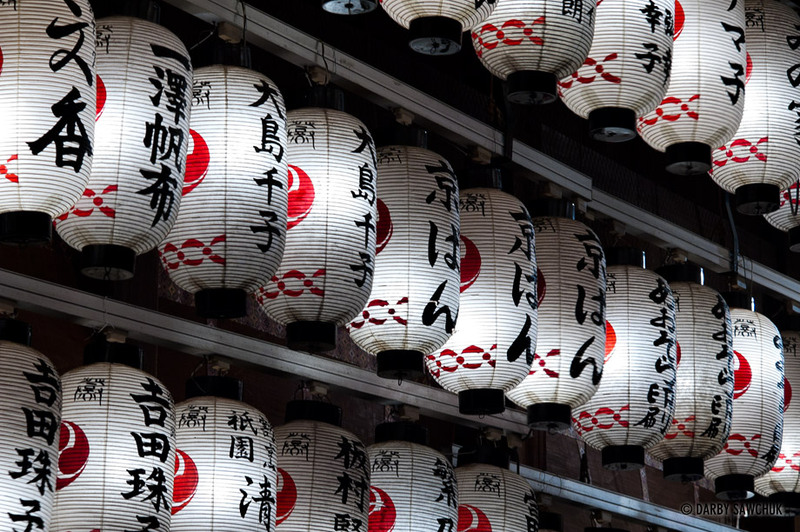 Traditional white Japanese paper lanterns hanging at the Yasaka Shrine in the Gion district of Kyoto, Japan. 32. 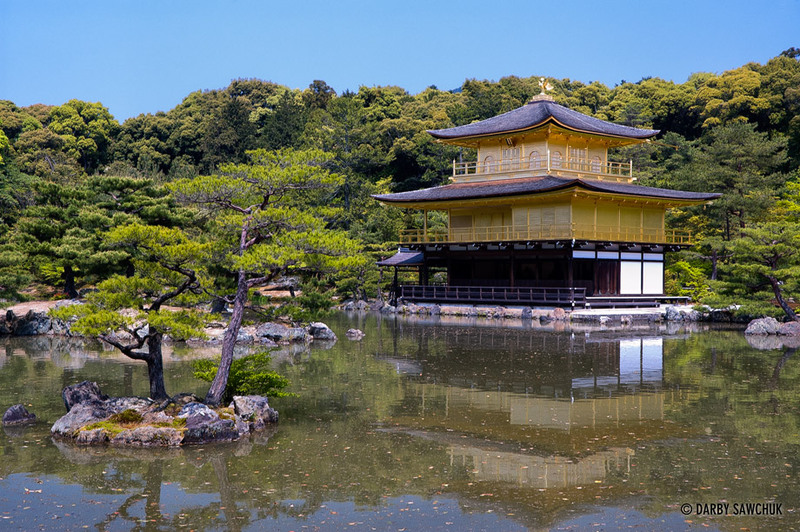 The Golden Pavilion of Kinkakuji Temple in Kyoto Japan. 33. 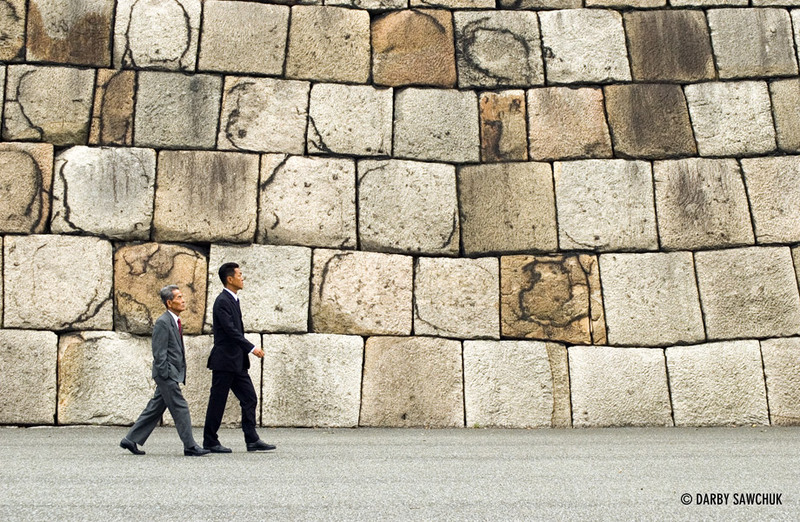 Japanese businessmen walk in front of the giant stones of a wall in the Imperial Palace in Tokyo, Japan. 34. 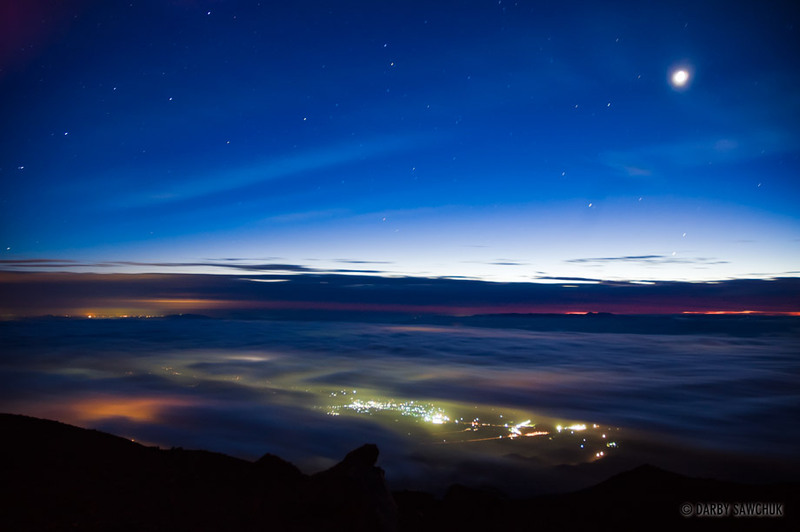 Villages shine their lights through the clouds at dawn from the top of Mount Iwate (Iwate-san) in Northern Japan. 35. 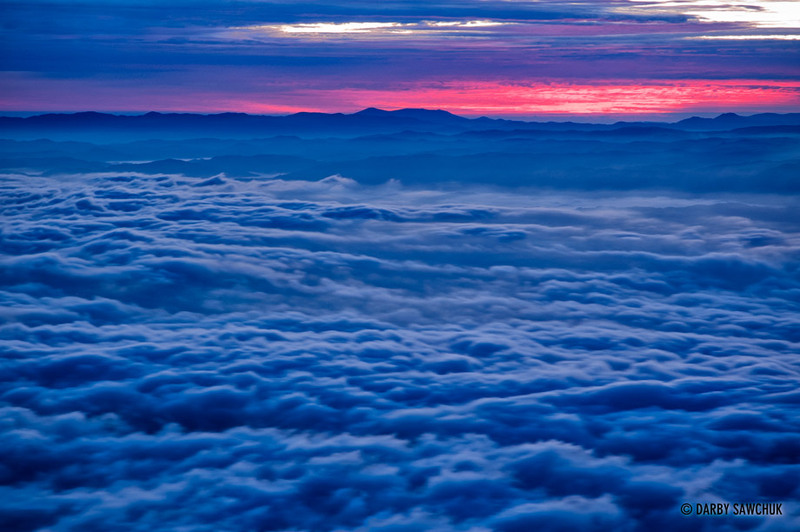 A view from above the clouds on top of Mount Iwate at dawn. 36. 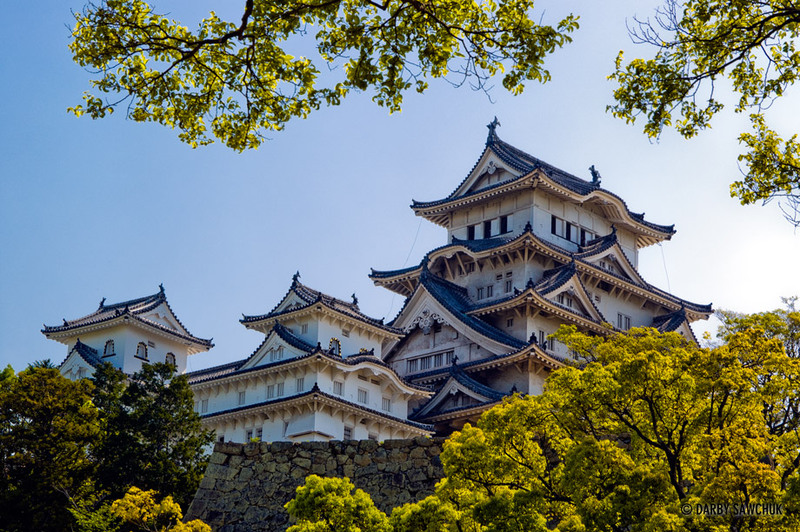 The central tower of Himeji Castle in Himeji, Japan. 37. 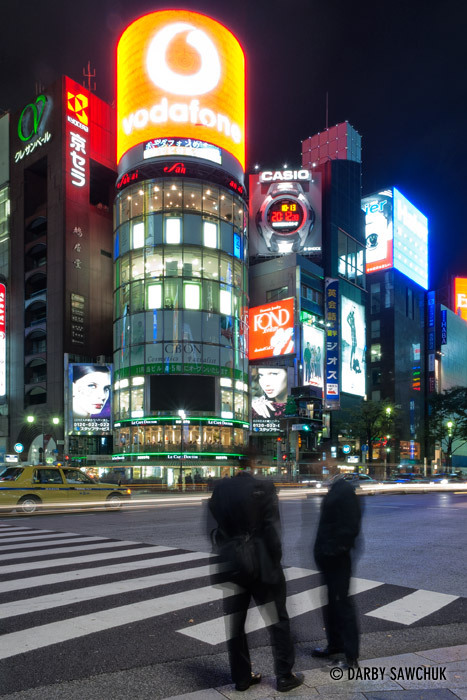 The bright lights of the Ginza shopping district in Tokyo, Japan at night. 38. 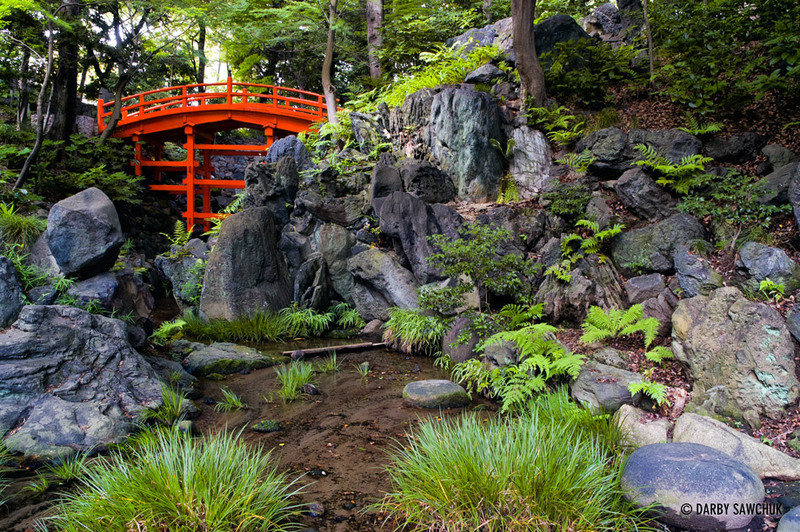 A traditional bridge in Koishikawa Korakuen, a garden in central Tokyo. 39. 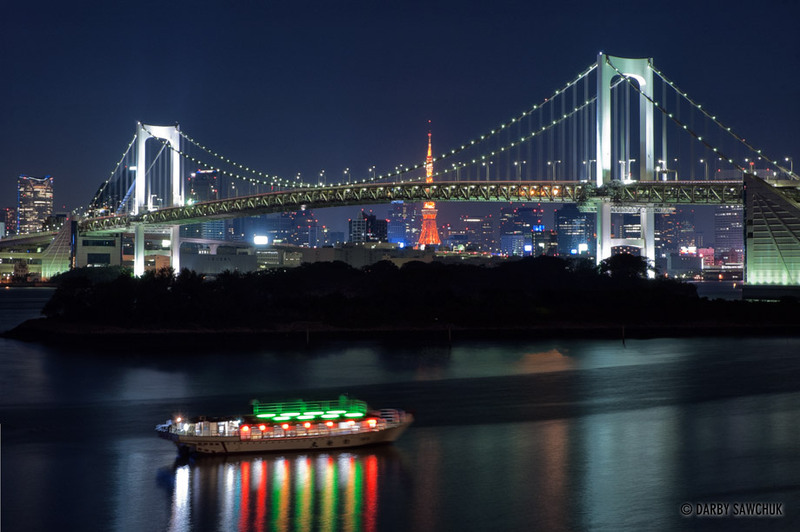 A boat floats past the Rainbow Bridge at night in Odaiba, Tokyo, Japan. 40. 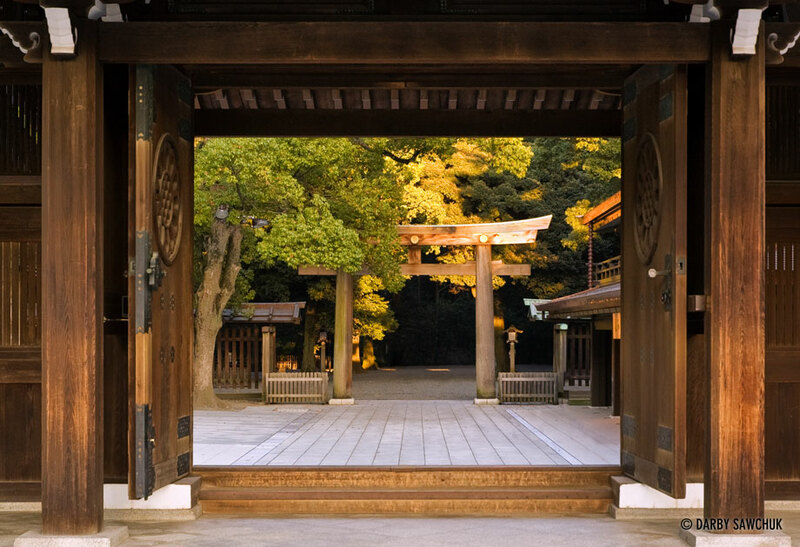 A torii gate at the Meiji Shrine in Tokyo, Japan. 41. 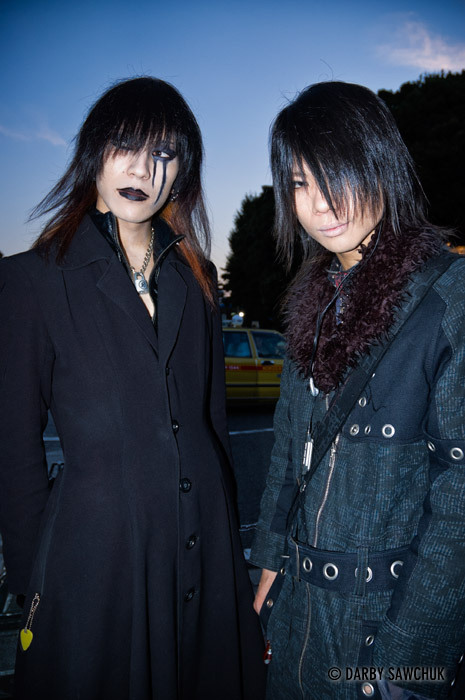 Teenage goths in Yoyogi park in Harajuku, Tokyo, Japan. 42. Skyscrapers in the Shinjuku business and shopping district in Tokyo. 43. 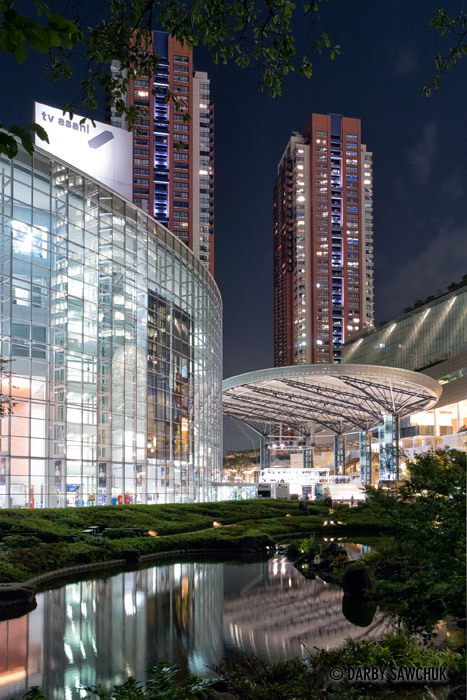 Modern buildings including the TV Asahi building light up the traditional landscape of Mori Garden in Roppongi hills, Tokyo, Japan. 44. 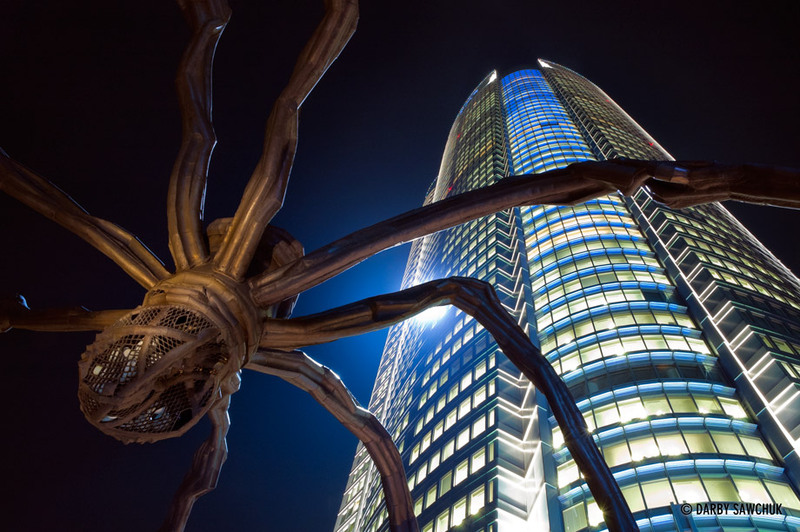 The Mori Tower stands over a sculpture of a spider in the center of the Roppongi Hills complex in Tokyo, Japan. 45. 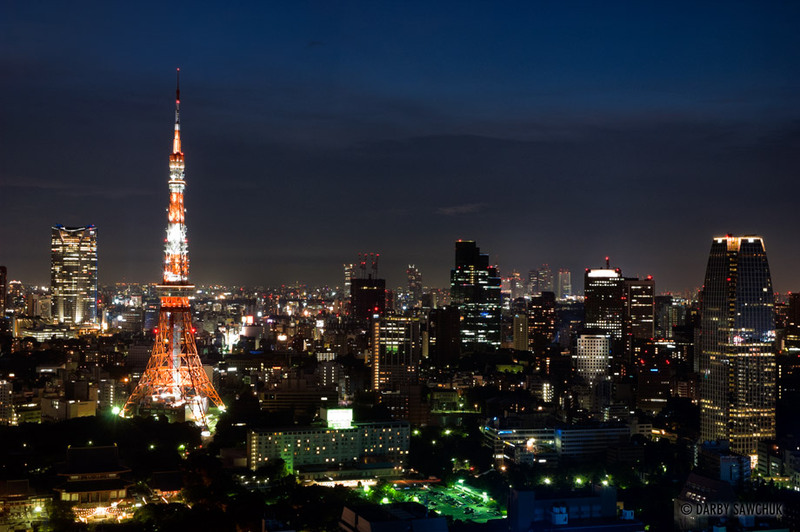 Tokyo Tower glows orange in a view from the Mori Tower at Roppongi Hills, Tokyo, Japan. 46. Sumo wrestlers slam into each other at the Ryogoku stadium in Tokyo, Japan. See more of my photos of sumo wrestling in Japan here. Keywords: photos of japan, images of japan, pictures of japan, asia, landscape photography, travel photography, architectural photography, japanese, fine art prints, stock photography. I second the first comment. I’ve just returned from my second trip to Japan and saw a few of these places. I’m particularly impressed by the Iwate-san shots. I had a similar view above the clouds from Murodo in the Alps, except that was during the day. Wouldn’t have thought to climb a mountain at night. Stunning.